With such long blades, hedge shears are designed to cut a much larger area with each stroke than any other pruning tool (unless you consider a machete a pruning tool). For this reason, and since they are straight, they create long, straight edges on your plant as they cut. Okatsune hedge shears are very user friendly and enjoyable to work with. 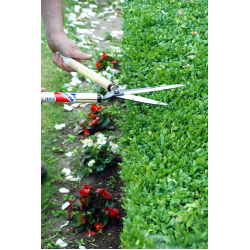 The range consists of 8 hedge shears: from real powerhouses for tough hedges to light compact shears for specialist topiary.